In recent months and quarters I have had discussions about why CPU manufacturers offer a number of processors each separated by $7 and 100 MHz. The obvious answer (but not always the logical answer) is to cater for what the customer wants by overloading them with choice. As a result, sometimes direct CPU comparisons can be difficult, as it requires testing every CPU released. Thankfully for AMD’s Kaveri, todays tests of the A10-7700K and A6-7400K plugs a few holes in our AMD benchmark numbers to allow those comparisons. 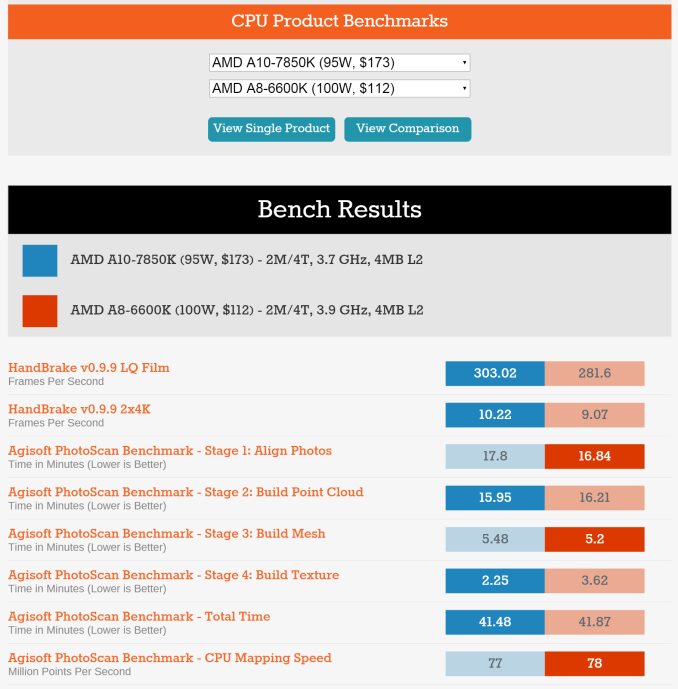 We recently reviewed the A8-7650K, a newer processor having been released at the turn of 2015, and thus a lot of the introduction on this page is going to mirror what we stated in that review, particularly when it comes to pricing, comparisons and the processor stack as a whole. We requested both the A10-7700K and the A6-7400K to fill in some of the gaps in our testing, though we do recognize they were released in mid-2014. This is unfortunately part of AMD’s Kaveri strategy – releasing one or two different SKUs each quarter to cover parts of the market. In this case, the A10-7700K is the lowest A10 part while the A6-7400K is one of the few single module (dual thread) available. The A10-7700K differs by having a total of 10 compute units compared to the other A10 processors which have 12. This means that it has a high CPU and GPU speed, but fewer GPU cores to play with compared to the A10-7800 or A10-7850K. 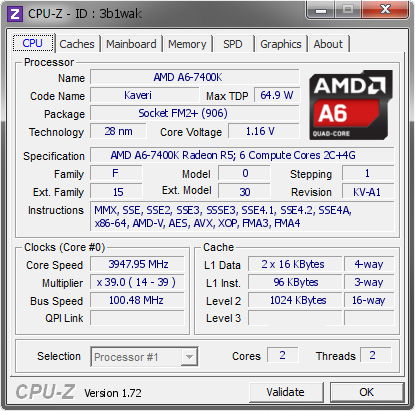 Compared to the A10-7800 also, we are dealing with the A10-7700K as a 95W part at $120, rather than a 65W part, but the A10-7700K is more geared towards overclocking which we cover later in the review. The A6-7400K sits at the bottom of the stack. That position and represents how AMD bins its processors, as the A6 still has all the same transistors. When the dies come out and are tested, if one of the modules is not working correctly it can be fused off from the rest of the processor and sold as a lower end part. The rest of the CPU is fine as represented by the high CPU frequencies, and it comes with a TDP of 65W at a low $64 price. The question becomes whether having only a single module (and two threads) is enough for it to power the 256 SPs in the graphics or if the CPU has the power for discrete cards now that more games are multithreaded. That being said, pairing it with a $70 R7 240 discrete card which has 320 SPs should, on paper at least, afford a good bump in graphics performance when in dual graphics mode for titles that can take advantage of it. For every tech product that comes out on the market, price is everything. A good product can become super obscure by virtue of a high price, or an overtly mediocre product might become interesting if it strikes a chord at a low price point. Then there is always a question of competition, understanding what a user can get at what price and whether there are features that make the experience worthwhile. This shows what is competing against what specifically at this time frame. One issue to consider is representing this in our benchmarking graphs. In our last review, the A8-7650K, we started quoting the pricing with the processors. Our graphs are not dynamic, and if we used the current price at the time of review, the later the review is arguably the better the recommendation. In that regard we decided to use the launch price of a product for our graphs to maintain a level of consistency. What pricing we quote aside, looking at recent prices in the table above gives competition for both the A6-7400K and the A10-7700K. The A6-7400K sits below the Pentium G3258 which we reviewed last year and is Intel’s low end overclocking processor. The A10-7700K sits more against the i3-4130 at $120. For our comparisons in this review, we have numbers for the G3258 but the nearest Intel CPUs to the A10-7700K we have are the i3-4130T ($138) and the i3-4330 ($128). All our results, both past and present, can be found in our online database Bench. 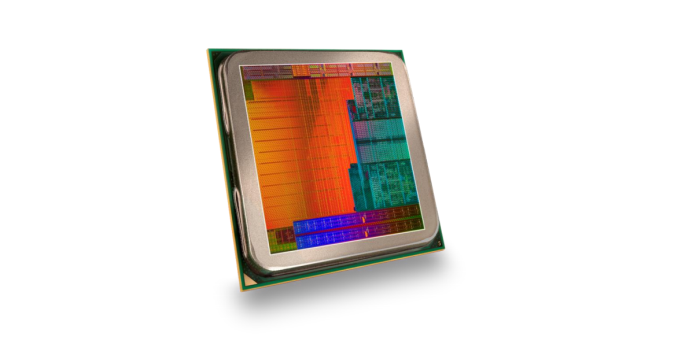 As we test CPUs in the future, look out for those results as well. We are using a new testing regime, starting from May 2015 including five recent games on different AMD and NVIDIA graphics cards from $70 to $560. A detailed breakdown of our testing can be found here, although for this review we will present a few of the more poignant tests while all the results can be found in Bench. For the A10-7700K, we hit 4.4 GHz relatively easily with a small bump in voltage, however as we pushed higher frequency it required even more voltage to compensate which led to a quick route to overheating. The A6-7400K starts with a high base frequency to begin with, but due to the disabled module on board it might have fewer heat generating areas and it could be construed that it might overclock more. In our testing, we had to change motherboards and the MSI has fewer overclocking options than the GIGABYTE, allowing only an offset voltage setting. 7700K has the iGPU from the A8 line! That's going s screw up a lot of people who don't know what they're buying. AMD could really benefit from clearer branding. Trying to be more obscure than Intel is not a good plan. This is the equivalent of Intel launching a new i5 chip with only 2 cores or an i7 without hyperthreading. The one thing that made buying the A10 worthwhile was that iGPU. Not your fault. Just blame those AMD guys. Could be worse. I bought an A8 3870 APU. Then bought a motherboard without video output.